It’s springtime, and the extra daylight and pleasant weather has got us looking forward to summer — good friends and family, good food and good fun. But grilling out is a little more complicated than just lighting a flame under some meat (and veggies, occasionally). If you’re going to grill, you’d better do it right. 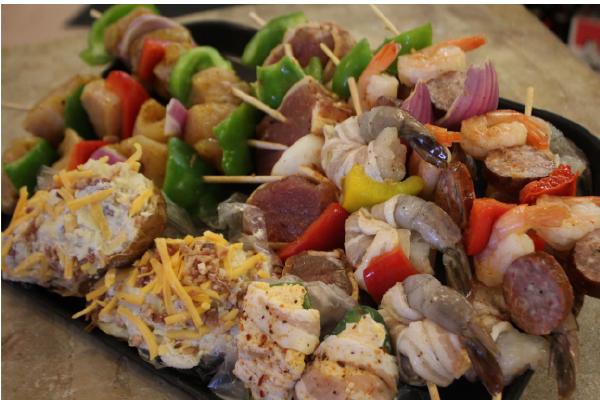 Check out these essential tips for kicking off grilling season the right way. You should be cleaning your grill every time you use it — but especially after it’s been sitting all winter. To make sure your grill is ready for the current season, you’ll need to superheat it — upwards of 1000°F. Start by covering the grill with aluminum foil, leaving a one-inch border for ventilation. Put it over hot coals or the gas burner, cover it and let it preheat for 10–15 mins. Then uncover the grill, remove the aluminum foil and thoroughly scrub with a grill brush. Lastly, wipe everything down with an oil-soaked paper towel, using tongs — it’s still hot! — and you’re good to go. Each time you fire the grill back up throughout the season, repeat the scrubbing and oil wiping. Simple. 2. Two Spatulas It’s nice to have a backup, especially for careful maneuvering of your meats while flipping. For best results, have a long spatula and a smaller, flexible one. 3. Grill Brush Remember tip #1? Keep things clean with a nice grilling brush, and make sure to replace it when the bristles wear out. Whether indoor or outdoor grilling, you’ll want to be prepared before you even start the flame. Got your tools and utensils, meats and vegetables, plates and sauces? Good. Mouths to feed? Great. Now you can light up. Get a batch of coals ready with a chimney starter rather than using lighter fluid, It’s safer and cheaper — and your food won’t have a gasoline flavor! For the grill to do its job, you’ll need to preheat. The coals may be hot, but the air in the grill will need time to heat up. If you cover the grill for 5–10 mins. With open vents, the air and metal will warm up consistently and effectively. And, of course, once the delicious meats are on the grill, keep the lid closed for consistent temperatures. Not a timer, not an uncle and not a poke of the finger. Gauging the internal temperature of your meat is the only indicator of its readiness for eating. For example, 130°F is medium rare. With the desired temperature in mind, use a thermometer to get an accurate reading before you pull it off the grill, regardless of the type of meat: beef, pork, chicken, seafood, smoked sausages or otherwise. Also, don’t just tear into that steak right off the grill. For optimal results, let the meat sit for a moment to let the internal temperatures and juices normalize for evenly distributed flavor. When you’re grilling up some mouth-watering fresh cut meats in front of the flame and under the glaring sun, you’ve got to stay hydrated. At Zavotski’s, we like to keep our hydration local. Maumee Bay Brewing Co., Great Lakes Brewing Co., Petoskey Brewing, Rhinegeist Beer and Platform Co. are all great options for cold beverages to have by your side as you fire up the grill.